Need help navigating WGL earnings? Following the market opening Thursday, the Dow traded up 0.07 percent to 20,082.33 while the NASDAQ climbed 0.10 percent to 5,662.20. The S&P also rose, gaining 0.01 percent to 2,298.43. Utilities shares gained around 0.16 percent in trading on Thursday. Meanwhile, top gainers in the sector included WGL Holdings Inc (NYSE: WGL), and Energy Transfer Partners LP (NYSE: ETP). In trading on Thursday, basic materials shares slipped by 0.44 percent. Meanwhile, top losers in the sector included Northern Dynasty Minerals Ltd (NYSE: NAK), down 7 percent, and Intrepid Potash, Inc. (NYSE: IPI), down 8 percent. Caterpillar Inc. (NYSE: CAT) reported downbeat revenue for its fourth quarter and issued a weak forecast for 2017. However, the company’s quarterly earnings exceeded expectaions. Cat reported Q4 adjusted earnings of $0.83 per share on revenue of $9.57 billion. Analysts expected earnings of $0.66 per share on revenue of $9.84 billion. Cat projects FY17 adjusted earnings of $2.90 per share, versus analysts’ estimates of $3.26 per share. Fuwei Films (Holdings) Co., Ltd (NASDAQ: FFHL) shares shot up 93 percent to $4.45 after the company disclosed that it has signed an annual sales contract for PCB with Eternal Electronic Material (Guangzhou) Co., Ltd.
Shares of Avinger Inc (NASDAQ: AVGR) got a boost, shooting up 39 percent to $3.19 after the company reported positive 24-month data from the pivotal VISION study of Lumivascular tech. CARBO Ceramics Inc. (NYSE: CRR) shares were also up, gaining 24 percent to $13.20 after the company reported better-than-expected results for its fourth quarter. World Acceptance Corp. (NASDAQ: WRLD) shares dropped 18 percent to $49.75 after the company reported weak Q3 results. Shares of DragonWave, Inc.(USA) (NASDAQ: DRWI) were down around 16 percent to $1.77. DragonWave disclosed that it has reduced the exercise price of its outstanding short-term warrants. Real Goods Solar, Inc. (NASDAQ: RGSE) was down, falling around 25 percent to $4.22. RGS Energy reported a public offering of common stock and warrants and issued preliminary Q4 results. In commodity news, oil traded up 0.61 percent to $53.07 while gold traded down 0.72 percent to $1,191.80. Silver traded down 0.77 percent Thursday to $16.85, while copper fell 0.35 percent to $2.70. European shares were mostly higher today. The eurozone’s STOXX 600 gained 0.31 percent, the Spanish Ibex Index fell 0.02 percent, while Italy’s FTSE MIB Index climbed 0.25 percent. Meanwhile the German DAX gained 0.39 percent, and the French CAC 40 slipped 0.01 percent while U.K. shares rose 0.14 percent. U.S. trade deficit declined 0.5 percent to $65 billion in December. Wholesale inventories increased 1 percent in December. Initial jobless claims rose 22,000 to 259,000 in the latest week. Economists were expecting initial claims to reach 250,000 in the week. The Chicago Fed National Activity Index rose to a reading of 0.14 in December, versus a prior reading of -0.27. The Markit Services PMI rose to 55.10 in January, versus a prior reading of 53.90. Economists projected a reading of 54.40. Data on new home sales for December will be released at 10:00 a.m. ET. The index of leading economic indicators for December is schedule for release at 10:00 a.m. ET. The Kansas City Fed manufacturing index for January is schedule for release at 11:00 a.m. ET. 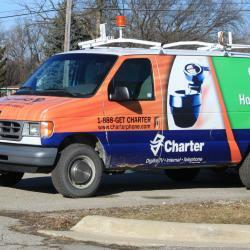 The Latest Content Pick: Verizon For Charter?